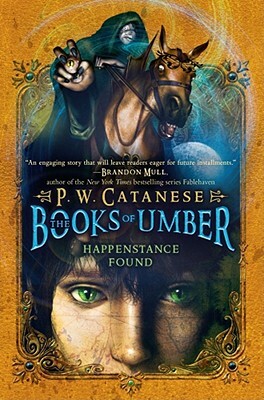 Happenstance Found (The Books of Umber #1) by P.W. Catanese. Grades 4-8. Aladdin (S&S), 2009. 342 pages. Review copy provided by my local library. Happenstance has no memory of his life when he's found by Lord Umber in an underground chamber. He has mysterious powers and he knows he's to play some part in a series of important events, but he doesn't know his own real name or where his mother is or why he's deathly afraid of water. All he knows is that an evil man is after him. And if Hap can escape, it might mean saving the world. I was pleasantly surprised by this book! I was all ready to write it off as Not My Thing, but then I opened it and started reading and... found myself devouring 100 pages in a single sitting. The action starts off right away with a giant killer worm attacking Hap and his new friends and it pretty much doesn't let up until the end. At first, it's a little disconcerting to be plunged into a story with no background (since Hap can't even remember what his real name is). But the reader's going through what Hap's going through - discovering new things about Hap as he himself is discovering them and Lord Umber is explaining the world to him. Also, it's obviously the first in a trilogy, but the story is resolved nicely while still nudging kids to look for the next book. I would hand this in a heartbeat to kids who loved fantasy-adventure series like Fablehaven or Pendragon. And I'm putting the entire series on my next order because I can already think of a handful of boys (and one staff member) who are going to eat these books up. It's a good, solid tween read. I'm ordering it for my Children's Department, but the Lord Umber character (who's older - an adult, but a young one) extends the appeal into the YA range, as well. Happenstance Found is on shelves now, as are Dragon Games (Books of Umber #2) and The End of Time (Books of Umber #3/conclusion of the trilogy). Afterschool at the ALSC Blog!